I've just read Packt Publishing's Joomla! Template Design by Tessa Blakeley Silver. This book goes into all aspects of a custom Joomla 1.0 template design process from initial design ideas through to the final packaging for distribution and installation. 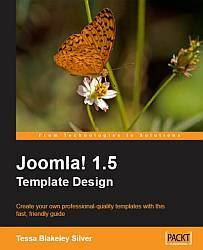 After reading this book you will be well on the way to building your own template designs within the Joomla 1.0 environment. This book really does cover everything you need to know about Joomla Template design. One proviso is that it is written for Joomla 1.0 but this is not a large a problem as you might imagine. Ok, a lot of the module and include calls are different but these changes are well documented at docs.joomla.org and it would be quite legitimate to build your design by following through this book and then convert the various position and include calls to the Joomla 1.5 spec. In my experience you can convert a Joomla 1.0 template to Joomla 1.5 with a few minutes copy and paste. But back to the book! Tessa takes you step by step through the design process, explaining where the major differences between designing a template and web page design diverge. All areas are covered including topics as diverse as dynamic menus & structures, AJAX inclusion and css rounded corners. This is a book targeted at beginners and you will learn a lot of skills that will be carried over to other areas of web design. So until an updated book covering Joomla 1.5 template design is released I can highly recommend this one.